It’s Friday… It’s Friday… Yea Yea…. Yea Yea!!! Are you starting every Friday singing our little song? No? Well, then… NO CROUTONS FOR YOU EITHER!!! BUT, that doesn’t mean that I can’t give something away to my readers too. Right? 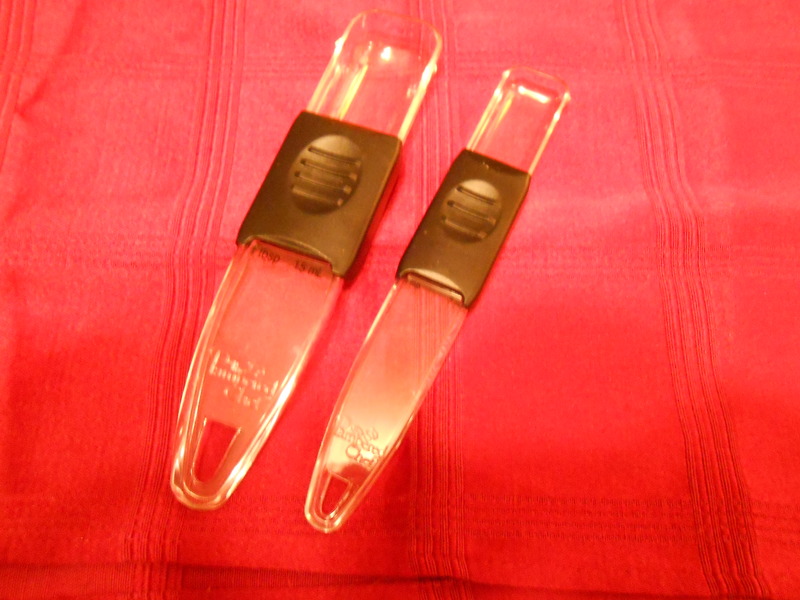 A set of Pampered Chef measuring spoons. There is a reason I picked the measuring spoons. I can be heavy handed on things like putting detergent in the washer or dish washer, or when adding an ingredient to something I’m cooking. If I don’t measure then I’m sure to use too much of whatever it is that I’m using. Using measuring spoons and cups has saved me quite a bit both in money and in disasters of recipes. If you don’t believe me, then take that teaspoon you use to put the sugar in your coffee or tea in the morning and scoop out with it what you normally do, then pour it into the teaspoon measuring spoon. I’ll bet it fills it and runs over the sides. HA! See, I told you. A friend of mine said she was sure to save money in dog food because when she measured out a cup of food compared to what she had been scooping, it was closer to 2 cups of food for her dog, twice a day. Now, that’s a huge savings! Anyway… To win, all you have to do is leave a comment about something you got from one of my blogs this week. I’ll have the Zman randomly pick a number and that will be the winner! It’s Friday… It’s Friday… Yea Yea… Yea Yea !!!!! Then, we’ll work on world peace…. I hope you have a Fun Friday and a lovely weekend! P.S. I have to exclude family from the giveaway (which is a shame, because I might not have a winner at all because of that) And, I have to limit the giveaway to US and Canada winners only. ZMan will do the drawing on March 30th. Posted on March 21, 2014 by LoriPosted in Friday Fun, GiveawaysTagged Friday Fun, Giveaways. Joy! That’s what I get every time I read your blog. Joy! 🙂 If you mean something you wrote about, then my answer is salt potatoes. I don’t think I’d ever heard of salt potatoes until reading about them here. Smiley! Your blog always makes me smile because you are so personable and I can actually hear you saying what your saying (that probably only makes sense to me). I cant wait to try salt potatoes when I have my own garden. Thanks Patti! Funny thing is… I actually do talk out loud when I’m writing my blog.